Let’s explore the powerful potential of partnerships! Adding an organization (or two) in support of your cause can quickly and easily spread your circle of influence. But it’s important to understand how to maximize the value of a partnership for both parties involved (and how to find a willing partner in the first place). Sometimes a partnership is as simple as reaching out to likeminded businesses and non-profits to help share your cause, like when Sea Watch-Shark Boat in California (a scuba and research group) posted this petition urging FedEx to stop shipping shark fins on their Facebook page (and even updated their cover photo to promote the petition). Exposure from supportive groups has helped the petition gather almost 300,000 signatures! What Are the Benefits of a Partnership? Take advantage of the professionals in the organization’s PR department. 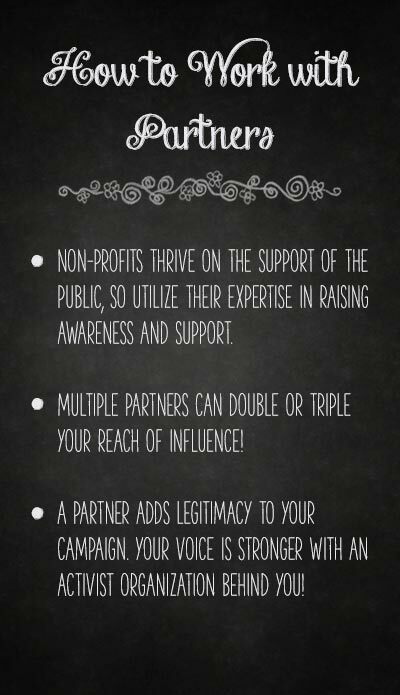 Non-profits thrive on the support of the public, so utilize their expertise in raising awareness and support. Multiple partners can double or triple your reach of influence! A partner adds legitimacy to your campaign. Your voice is stronger with an activist organization behind you! Are All Non-Profits Created Equal? No! A quick Internet search will uncover like-minded organizations, but dig deeper to the core values of any group or individual related to your issue. Beware of greenwashing groups (“clean coal” campaigns are an example that try to spread the false premise that coal is ‘green’ with happy nature photos). Don’t jump to associate yourself with a group that may actually be a front for something sinister. Check to see if they have any political affiliations or covert funding sources, if they are reputable and respected among their peers, or have a history of conflict and public meltdowns. Offer to promote the organization to your own circle of influence during and after the duration of your petition. Volunteer labor and manpower for their organization, if possible. How Do You Approach a Potential Partner? Start with anyone that you’ve already met or know. Ask them for a reference or if they’ll point you in the right direction. If you’re new to the organization, start with the website. Focus on the director of communications, campaign directors or even contact the director of the entire organization. Explain in simple, polite terms who you are, what your cause is and why you want their help. Always keep in mind that finding a partner to promote awareness of your cause should be beneficial for both parties. Treat your search for a partner organization as an opportunity to broaden your own awareness of issues related to your cause!